Hi everyone!!! How is your weekend going??? Mine is wonderful... I DID NOT spend it in the garage yesterday... I ran some errands and then decided to rent some movies... bought some scallops at the fish market (man..that place was mobbed...) - came home and flopped on the couch and watched movies and did some hand sewing. It was a wonderful day! Then I fixed my yummy scallops! They were sooooo very good. 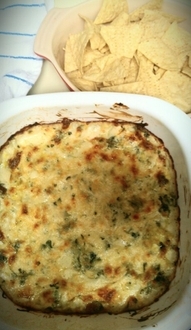 We had some baked chicken too with a new coating that Jack found at the grocery. NOT my favorite but it was edible. Isn't this adorable? 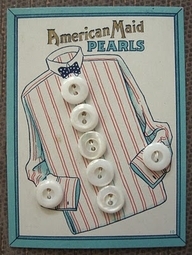 I wonder why manufacturers don't take the time to make cute button cards like these anymore? Probably to time consuming and expensive. Now this is something else!! Wouldn't it be so pretty framed and hung in your sewing studio? Especially in mine since I have a collection of blue and white antique platters (on the walls) and blue and white quilts!! 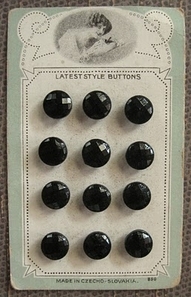 These black buttons... 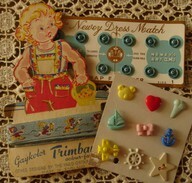 I remember my Grandma Rawley having button cards similar to these. She could sew anything and worked in a women's dress factory. 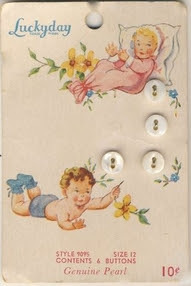 This is another wonderful button card!!! I love when they incorporate the buttons into the printing of the card. 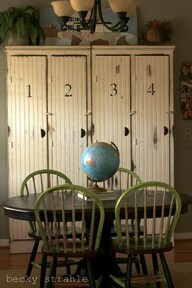 It gives it so much more character...it just makes you WANT to buy the buttons whether you need them or not! 5.) Cook for 30 minutes. I know this may look like paper.. but imagine it as scraps of fabric... let's say you've been working on blocks and the directions now tell you to cut them down. 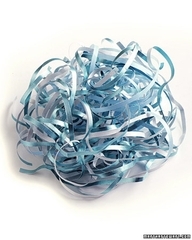 You've finished that part of the project and you have this pile of fabric cuttings that is good for nothing... WRONG... Take them outside on your patio deck... you can kind of roll them into a ball....before you know it.. the birds will be taking pieces away!!! They love to use them in their nests. Squirrels like it too! Isn't that a sweet idea? They also like the lint stuff that comes from your dryer!!! They will now have some 'high-stylin' nests!!! hahahahaha! 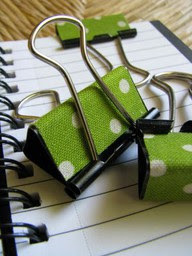 Okay... these have no significance at all... except... THAT I WANT THEM! I just think they are adorable!!!! Wish my honey would make them for me.... NOT... that will not happen. Ok...I think this goes on my "personal" bucket list! Of course... I have no clue where I would put them in my house... but I've decided that doesn't have a single thing to do with wanting something... right? Look at my 'funny' picture for the day.... I simply burst out laughing when I saw this silly fox!!! Isn't this a hoot? I wonder if he was chasing a bug.... ??? Or just plain having a GOOD time! He's adorable. I know when we would be traveling the roads - going to quilt shows - we would every so often see a sweet fox that would have been hit by a car... so sad. They are such gorgeous animals! Since I'm going to the garage today (such pain....) it's time to look at all of your yard tools. Get them all in order... install a rack on the wall and hang up the shovel, hoe, rakes. OR... an even better and faster idea (if you have room... I know what some of these garages look like...) get a sturdy - TALL - garbage can... it could even be one that you've been using (that needs to be replaced). Store all of your long yard tools (rakes, etc.) handle down in the garbage can. This will keep them from falling all over the garage...easy for the kids to put away (should they EVER use one of them)... and make your life so much nicer in the garage! Oh... and speaking of garbage cans .... is it time to get rid of those that are a MESS??? Have you ever tried to get the garbage men to take away an OLD, BEAT UP CAN? They won't do it... they simply don't get it! Jack had to finally pound the stew out of one and put it inside another one so they would take it..... Now.. they have NO PROBLEM beating the crap out of the good ones we use... or ... who knows where the lids disappear too? (we now have cans with attached lids). It's time for another cup of coffee! !